Already have a Username/Password for RUDN Journal of Law? Length of the manuscript should be no less than 6000 words and no more than 9 000 words. Please consult the MS Word built-in statistics service prior to submission in order to find out the exact length of your manuscript. Should your manuscript exceed the aforementioned limits, the editorial board will carry out the final decision on its publication based on recommendations from your reviewer. Abstract of an original study should start with some brief background information and statement of the study’s AIMS, followed by MATERIALS & METHODS and finishing with the RESULTS. The closing sentence should outline the main CONCLUSIONS of the study in the most comprehensible terms. Please note that your abstract should be 300 words. Choice of keywords. 7 to 10 keywords are preferable. Number of references is from 25 for original studies. A citation is the part of the reference that include within the main body of article whenever you directly quote from, paraphrase, summarise or refer to work produced by another author. Harvard style requires the use of a partial reference to the sources you are referring to in the text of your article. The in-text citation appears in the format of author-date or name-date enclosed in brackets e.g. You should include page numbers if you quote directly from the text, paraphrase specific ideas or explanations, or use an image, diagram, table, etc. from a source. For Legal Sources (Legislation/Cases) are used Footnotes. Norcross, F. (1910) Criminal Law Reform. Journal of the American Institute of Criminal Law and Criminology. 1 (3), 386–393. Lamond, G. (2014) Analogical Reasoning in the Common Law. Oxford Journal of Legal Studies. 34 (3), 567–588. Available from: doi:10.1093/ojls/gqu014. Winkel, L. (2010) Forms of Imposed Protection in Legal History, Especially in Roman Law. Erasmus Law Review. 3 (2), 155–162. Available from: http://hdl.handle.net/1765/21274 [Accessed 20th January 2017]. Gray, C. (2012) The philosophy of law. New York, Routledge. Merryman, J. & Pérez Perdomo, R. (2007) The civil law tradition. Stanford, Calif, Stanford Univ. Press. Killian, J. H. & Beck, L. E. (eds.) (1987) The Constitution of the United States of America: Analysis and Interpretation. Washington, U.S. Government Printing Office. Randall, L. (2012) Peace Treaties and the Formation of International Law. In: Fassbender, B., Peters, A. & Peter, S. (eds.) The Oxford handbook of the history of international law. Oxford, United Kingdom, Oxford University Press, pp. 71–94. III. Reduce graphical material to minimum (unless the nature of your study dictates otherwise). Photographs should be rich in contrast, illustrative artwork should be clear and of high resolution (dpi). V. Cover letter. The journal editorial board requires authors to submit a scanned copy of a cover letter from authors team in *.pdf format. We expect a cover letter to summarize concisely why your paper is a valuable addition to the scientific literature and briefly relate your study to previously published work. Cover letter should be signed by all of your co-authors. We accept separate letters from authors if they have different affiliations declared in the manuscript. VI. Using the WEB-form to submit a manuscript. Indexing in Russian and international databases requires certain metadata to be provided for your paper. List of references should be organized according to the guidelines by U.S. National Information Standards Organization NISO Z39.29-2005 [R2010]) in Harvard style. For detailed instructions on bibliographic formatting, see REFERENCE LIST EXAMPLE and http://www.imperial.ac.uk/admin-services/library/learning-support/reference-management/harvard-style/your-reference-list/». The Federal State Autonomous Educational Institution of Higher Education "Peoples’ Friendship University of Russia” (RUDN), represented by the Vice-Rector for Scientific Work Nur Serikovich Kirabaev, acting under a Power of Attorney dated № 44-09/16-144 от 27.07.2016 г., hereinafter referred to as the Publisher, on the one hand, hereby offers to the public at large, hereinafter referred to as the Author, on the other hand, hereinafter collectively referred to as the Parties, to enter into this agreement, hereinafter referred to as the Agreement, regarding publication of scholarly materials, hereinafter referred to as the Article, in the Journal named 'RUDN Journal of Law', hereinafter referred to as the Journal, under the following terms. 1.1. Pursuant to Clause 2 of the Article 437 of the Russian Federation Civil Code, this Agreement shall be recognized as the public offer, hereinafter referred to as the Offer. Subject to Article 438 of the Russian Federation Civil Code, this Offer shall be deemed to have been completely and irrevocably accepted after the Author had submitted his/her materials by uploading those onto the network electronic system of the article acquisition for review available at the respective section of the Journal's site at URL: http://journals.rudn.ru/index.php/law/author/submit/1 on the Information and Communication Network known as the Internet, hereinafter referred to as the Internet. The Offer Acceptance means a complete and irrevocable acceptance of the Offer under the terms specified in Clause 3 hereof (the Author accepts the Offer by submitting an application to the Publisher, i.e. 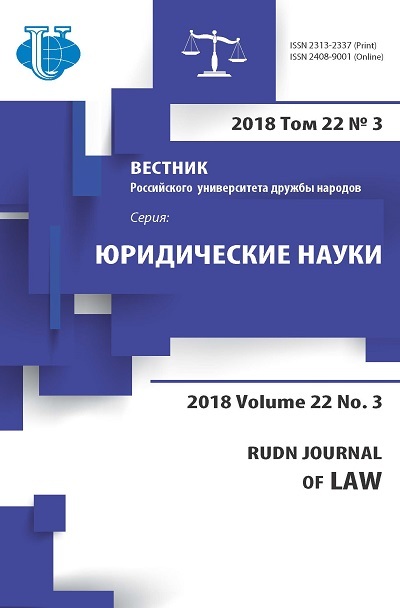 by uploading the Article along with support materials onto the network electronic system of the article acquisition for review available at the respective section of the Journal's site at URL: http://journals.rudn.ru/index.php/law/author/submit/1 on the Internet). The Journal means an academic periodical named 'BULLETIN of Peoples’ Friendship University of Russia. Series Law'. The Application means an electronic request of the Author addressed to the Publisher for publishing the Article in the Journal by uploading the Article and support materials onto the network electronic system of the article acquisition for review available at the relevant section of the Journal's site at URL: http://journals.rudn.ru/index.php/law/author/submit/1 on the Internet). The Offer means this document (offer to the Author) to publish an Article by uploading it onto the site at URL: http://journals.rudn.ru/index.php/law/author/submit/1 on the Internet. The Article Requirements mean requirements to the materials published in the Journal's section named "To Authors" of the Journal's site at URL: http://journals.rudn.ru/index.php/law/about/submissions#authorGuidelines on the Internet. 3.4. This Agreement shall become effective from the time the Article is submitted to the Journal, i.e. uploaded along with support materials onto the network electronic system of the article acquisition for review available at the relevant section of the Journal's site at URL: http://journals.rudn.ru/index.php/law/author/submit/1 on the Internet, hereinafter referred to as the Article Upload. 3.7. The Publisher undertakes, throughout the currency of this Agreement, to provide to the Author the services associated with publication of the Article on the Journal's site at URL: http://journals.rudn.ru/index.php/law on the Internet. 7.2. If the Author disagrees with any modification in the terms of this Agreement, the Author shall have a right to submit a written notice of his/her withdrawal from this Agreement by uploading it onto the network electronic system of the article acquisition for review, available at the relevant section of the Journal's site at URL: http://journals.rudn.ru/index.php/law/author/submit/1 on the Internet.